Best Horror Comics: "...And All Through The House..."
"...And All Through The House..."
Cloud 109's blog has posted EC's "...And All Through The House..." from 'Vault of Fear' #35. For those of you not familiar with Johnny Craig, you're in for a treat. This version is black and white which really showcases Craig's talent. 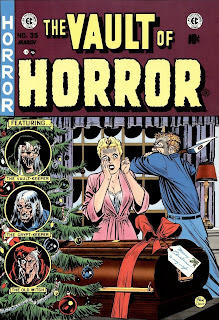 This is certainly one of the best Holiday horror comic stories of all time.